Like each Friday, a group of random friends and collegues go to some random place to do some cooking. This time, we did it at my Peruvian friend apartment. 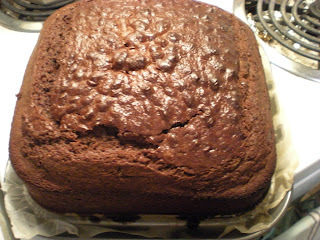 When we arrived at his place, there was this large freshly baked chocolate cake lying on the counter. This cake was made by my Peruvian friend cousin for her party. She was nice enough to share part of the cake with us and give out the recipe. I don't have any step-by-step pictures this time, I will have the pictures up once I made my own version. 2. Sift the first four ingredients together 3 times onto a large bowl. Set aside. 3. Combine oil and vinegar in a medium bowl. Pour little by little the liquid mixture to the flour mix, while stirring with a wooden spoon. 4. Add eggs one by one until batter becomes smooth. 5. Stir in the sugar to the batter. 6. Pour batter to cake mould. Bake for 45 mins. Insert large toothpick to check for doneness. Let it cool for at least 30 mins. Chocolate makes me sing. This look absolutely delicious. I wish I could have one right now. Just ate dinner. Need something sweet. Looks really good! Thanks for the sending this post.